I stumbled across this album sometime in the last year and I don’t know how. I had an MP3 that I got from who knows where and have been looking for a vinyl copy ever since. This past weekend I found one at one of my new favorite record stores: Discland in Bloomington Minnesota. What I love about this LP is that it has a real soul feel. This was when Willie was on Atlantic Records and it was produced by Arif Mardin, Jerry Wexler and David Briggs (Neil Young). The most famous song on the LP is Whiskey River. But I absolutely love the first cut: Shotgun Willie – it is a bit of typical country Willie, but added with some Memphis spice courtesy of the Memphis Horns (Stax Records). 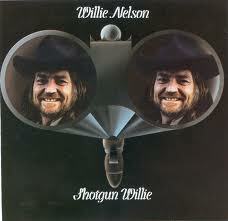 I don’t think I have ever met a Willie record that I did not like, but this is a first among equals (AKA a masterpiece). I have fallen in Love with your blog. This is exactly the kind of thing I want to read while sipping my morning cup of coffee.